Subaru teamed up with the Leukemia and Lymphoma Society to deliver messages of hope and 150 specially made blankets to patients at MD Anderson Cancer Center at Cooper. Participating in the delivery of the blankets to MD Anderson Cancer Center at Cooper were: Thomas J. Doll, president and COO, Subaru of America; Nancy Biba, a patient at MD Anderson Cooper; Adrienne Kirby, president and CEO, Cooper University Health Care; Christine Winn, senior vice president, MD Anderson Cooper Cancer Institute and Physician Alignment; and Mark Roithmayr, chief relationship officer, Leukemia & Lymphoma Society. 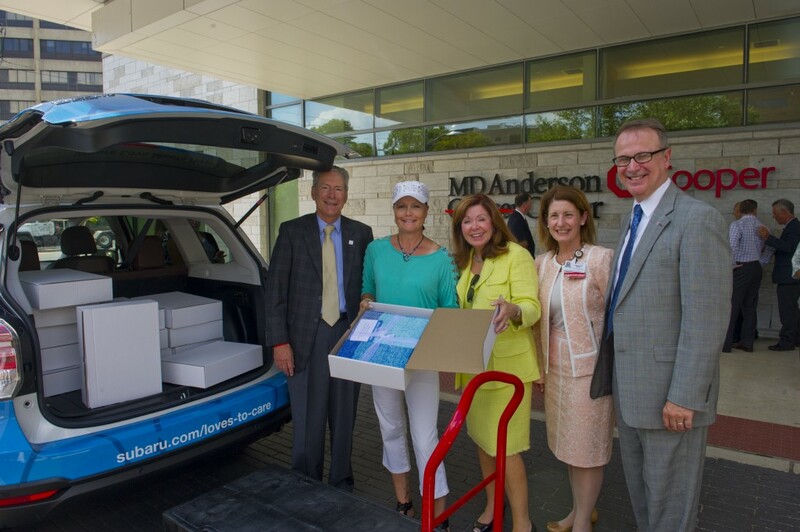 This week, Subaru teamed up with the Leukemia and Lymphoma Society to deliver “Gestures of Hope” to cancer patients at MD Anderson Cancer Center at Cooper. On Aug. 16, executives from Subaru of America’s corporate headquarters, representatives from the Leukemia and Lymphoma Society and representatives from Subaru of Cherry Hill delivered messages of hope and 150 specially made blankets to patients at MD Anderson Cancer Center at Cooper. The goal was to help encourage patients and keep them warm as they continue their fight against cancer. The event was part of Subaru of America and LLS’s initiative to provide support and warmth to cancer patients and their families in communities across the country. In June, visitors at participating Subaru retailers wrote messages of hope to cancer patients as part of the Subaru Loves to Care initiative. Since the program began, more than 30,000 blankets have been donated to cancer patients nationwide.